One Word to Describe February: Fun! Are you ready to start your own blog? Awesome! You are going to be great at it! Check out my step-by-step tutorial on how to get your blog up and running in just minutes! Click here to join us in Women Winning Online! Thrive Landing Pages: $110.25 —> This income comes from this page where I show you how to set up a landing page with Thrive. SiteGround: $100.00 —> This income comes from a page where I show you how to start a blog in under 10 minutes. February was a fun, fun month! Lots of celebrations and meeting new people in the Facebook group. It was fun to hit a lot of my goals and even more fun to help more people. That’s why the word this month is fun! 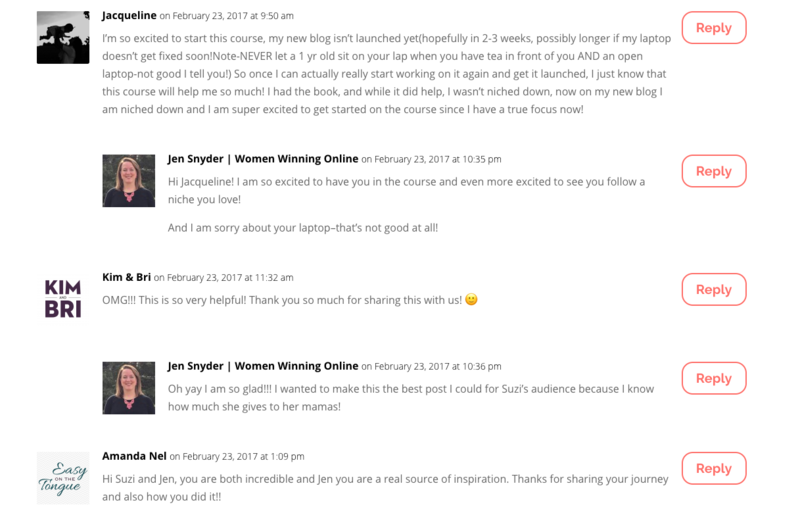 On February 8th, Women Winning Online turned one and I celebrated in a big way! We celebrate our kids turning one with big parties so I thought why not do the same with the blog?! I almost didn’t do it. I had just come off of updating and re-launching Find Your Tribe Online and I was tired. And probably a little burnt out. But I thought what the heck? Why don’t I email some of the bigger companies and see if they would participate. If they say yes, I’ll do it. I emailed SiteGround, ConvertKit, PostPlanner, and Tailwind. The first surprise was when both SiteGround and Tailwind and PostPlanner all said yes the very next day. Now I was excited! I thought alright let’s go big then! I had Tailwind for Pinterest or Instagram to offer free for a year. I had PostPlanner and SiteGround free for a year to offer as well. My friend Suzi’s course, Blog By Number, free. My friend, Lena’s book, How I skyrocketed my pageviews from 17,000 to 450,000, free. Now I was ready. I built a landing page using Thrive, set up my emails, and I was ready to go. Each day at 9am I would announce the new giveaway for the day. People could enter to win the giveaway everyday. Then on February 8th, the day of WWO’s birthday, I announced the winners live in the Women Winning Online Facebook group. I have to tell you this was THE most fun I have ever had at “work” ever! First I was giving away prizes that I knew would help people. I knew it would make a difference in their blogging life. Second, I felt like it was Christmas Eve every night for a week! I got to share a new prize every morning. It was so much fun! Then the night of the giveaway came. I got all dressed up, put on some makeup, poured a glass of wine, and started announcing names. I had 50+ people show up. I have been doing Facebook lives for a while now, but I was so nervous! It ended up being a wonderful night! Everyone was excited about the announcements even if they didn’t win and supportive of the winners. I can’t wait to do it again next year! Takeaway: Don’t forget that in the middle of all the writing and promoting, blogging is supposed to be fun! Give yourself permission to enjoy it again. Take time out and do something fun to celebrate your blog and your readers. Maybe you don’t have to wait for a blogging anniversary. Maybe it could be a celebration to hitting 500 people on your email list. Or celebrating your 100th blog post. Whatever the cause for celebration I encourage you to have fun with it and try something different! 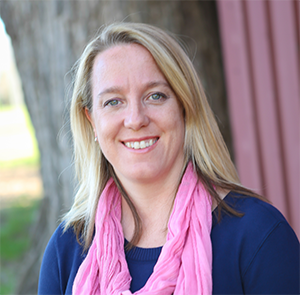 At the end of the month I did a guest post for my friend Suzi Whitford on Start a Mom Blog. Suzi and I had talked about doing this for awhile and a spot opened up and I took it! We agreed that I would write about Find Your Tribe Online. In February Suzi featured four guest posts on how to make money blogging. Mine was one of them! In my post I detailed my journey of how Find Your Tribe Online came to be. I shared how I thought of the idea, how I put it together, and how I launched it. I also shared the mistakes I made and the wins I had along the way. It was a very open and honest blog post and the results were incredible! First and most importantly, I got a lot of good feedback on the post. People said it really helped them and anytime I can do that, I’ve hit a home run! Second, my traffic went crazy the day the post went live! Third, I got new email subscribers! Finally, I got a lot of new clients for Find Your Tribe Online! The added bonus is that I got to guest post on my friend’s blog and she is someone I love and respect so much. It felt incredible! 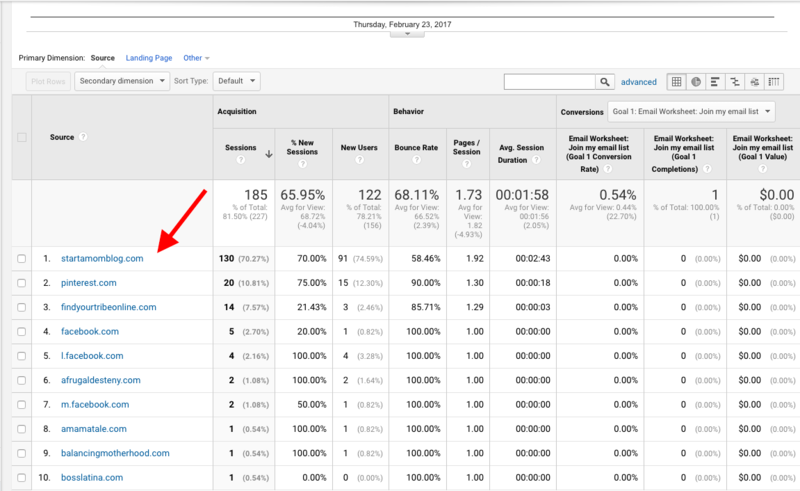 Takeaway: Guest posting works! I know this and need to do more of it! But what I have learned is that it has to be the right kind of guest post. It has to be one that fits with the blog, but stands out. I think there is something to doing case studies like this on popular blogs. I will be examining this more in March. In February I did my first guest posting interview with my friend Darci Lopez of Life Unplanned. I was a little nervous to do it because it is more on the personal side. I shared my struggles with my four chronic illnesses. I was scared to put this out there because hey, everything looks good on Facebook right?! I was worried people would think of me differently. I also struggle talking about my illnesses because my parents weren’t very supportive of me when they were in my life. They had the either ignore it or buck up and deal with it mentality. I thought I might get empathy from people and that is almost hard for me to deal with because of my parent’s reactions to my illness. But like most things I do, I did it scared. I love Darci because she gently encouraged me to get it done. My post went live on February 21st and I kind of held my breath. I have to say I had nothing to worry about! 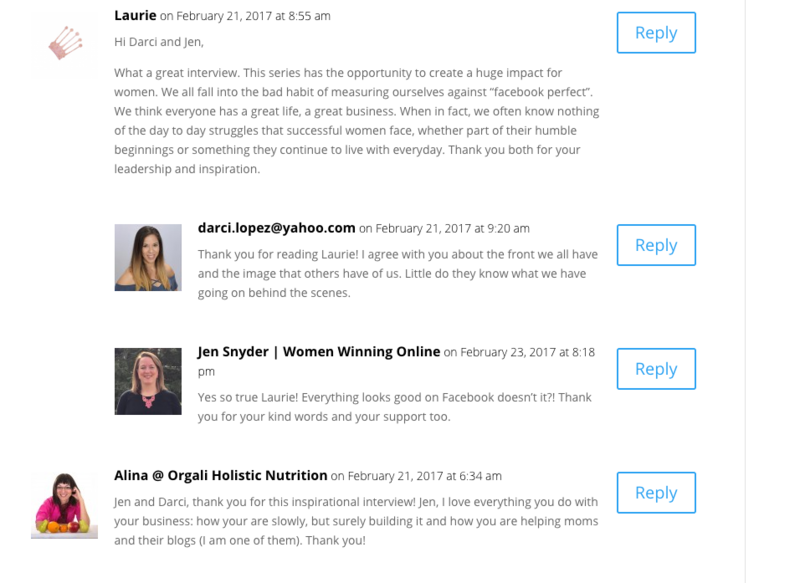 People were so kind to me and left me the nicest comments on the post and on the Facebook post I shared in Women Winning Online. I also shared it on my personal page which was super scary for me. I also received a lot of kind words on that post. It’s funny because my illnesses are no big deal to me until I have to put them out there. Takeaway: Anytime you can be vulnerable and help someone you are doing the right thing. We need to feel connected and that we aren’t alone. It felt good for me to see that I wasn’t alone. It’s also good to do things scared. If it feels scary to you do it! 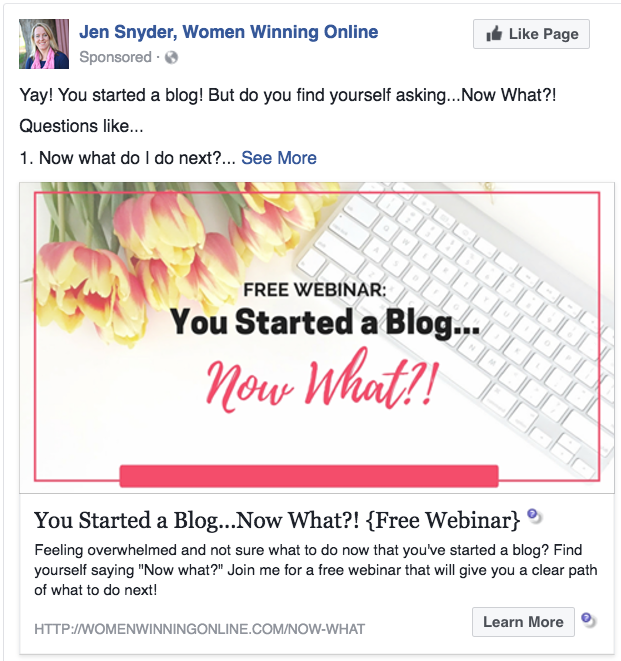 On February 20th, I launched my new webinar “You started a blog, now what?” I did an afternoon and an evening session. I changed this webinar to share ideas of what to do next after starting your blog. There are so many good ideas of how to start a blog, but not a plan of what to do next. I shared those ideas in this webinar. The webinar went great! I got a lot compliments on my content and on my slides. People walked away feeling like they got a serious education in an hour. I like that! I don’t like webinars that are 20% content and 80% sales pitch. I try to do opposite and make it 80% content and 20% pitch. I got a lot of feedback that this is exactly how people saw my webinar. Takeaway: If you want to do a webinar take a lot of time to write an outline and deliver value that people will love. We are very busy people and if we are giving up an hour of our time, it has to give a lot of value! Otherwise we are just left with that ick feeling! On February 20th I announced I was raising the price of Find Your Tribe Online. My reason for raising the price is because I am adding more content to it. In March I will be adding a section on guest posting, plus updating the content. At the end of the webinar on the 20th, I announced the price would be going up. The next day I announced it to my email list and to my Facebook group. I let everyone know that on March 1st the price would change. I was firm that the price would never again be $47. I am experimenting with different methods of how to sell Find Your Tribe Online. As is my style, I am trying to see what works and doesn’t work. Then I report it back to you so you can use it for your blog. Letting people know the price was going up made a huge jump in sales. For the week of February 20th-28th, I sold 45 copies of Find Your Tribe Online. It was such a fun week! I am so grateful for the people that purchased my course. They are joining us in our private Find Your Tribe Online Facebook group and already seeing results. I love it! Takeaway: Don’t be afraid to raise the price of your courses. It’s scary at first because you don’t know if people will buy at a higher price. But you have to have faith in yourself and your course that it will work. And hey, if it doesn’t you aren’t married to the price! You can always lower it. This is all an experiment! In February I committed to posting every single day on Facebook group promos. Facebook group promos are days where you can share your posts on a special thread or on the main wall. In Women Winning Online we have promo days on Friday and Saturday. I belong to a handful of groups that have great promo days. They drive a lot of traffic to my blog! I will say this strategy worked! I can’t measure how much of the traffic below came from my promo days, but overall Facebook sent me 3,430 pageviews. The first week of the month I shared my giveaway in the promos and that drove a ton of traffic to my site. The next week I shared my webinar landing page. The third week my income report for January. 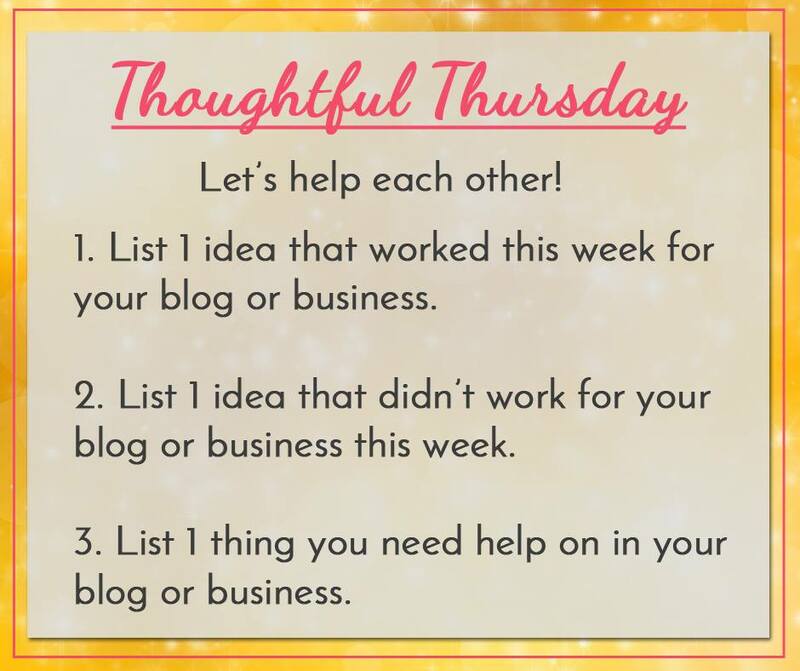 The fourth week my post on 36 things all new bloggers should know. I tried to change up the content between each group to make my post sound fresh. I got a lot of good feedback, pins, and tweets on my posts. It was fun! Takeaway: Consistency counts! Any strategy that works a little bit will work even better when you are consistent. Showing up every single day and posting in Facebook groups increased my visibility online. 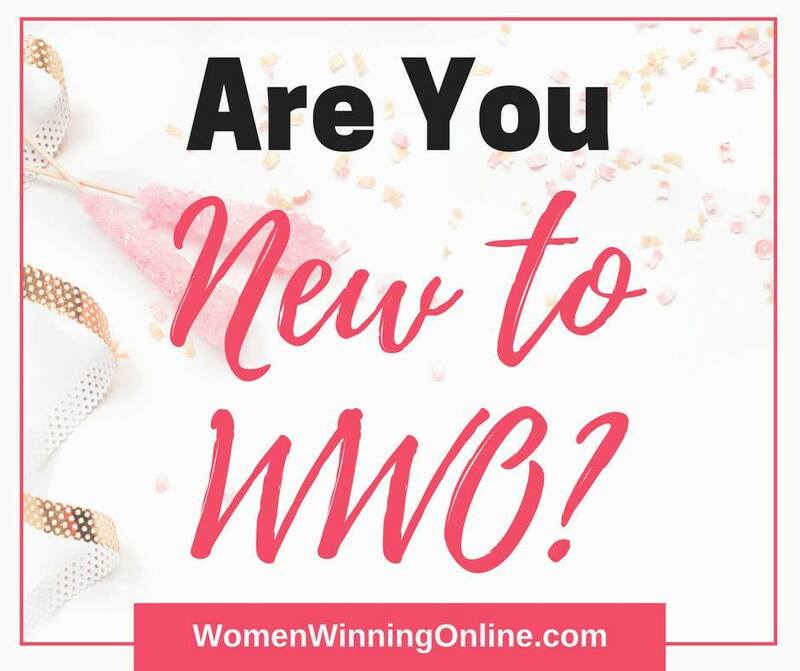 Increasing my visibility increased my traffic, my email subscribers, and the number of members in Women Winning Online. In February I launched two Facebook ads. One for my giveaway and one for my webinar. I had done Facebook ads with my last blog and had pretty good success. I have been dying to tinker with it for Women Winning Online. February seemed like a good month to start as I had two big things going on. This is the ad I ran for the giveaway. That have visited my website in the last six months, a warm audience. Who had the word “blogger” in their job description, a cold audience. That were a “lookalike” audience of my Facebook group and people that had visited my website. Also a cold audience. The goal was to have people sign up for the giveaway which also means they subscribed to my email list. The results were fascinating, but not totally surprising. The “blogger” group ad reached 825 people, generated 2 new subscribers at $4.49 per subscriber. Ouch! This was a shot in the dark ad. Before running another ad to a new group I would work on my targeting. The “warm audience” group ad reached 989 people, generated 164 new subscribers at $0.11 a subscriber. This was much better than the other two! Warm audiences do better with these ads because they know who you are and are more likely to trust you and your ad. It was a giveaway and it’s fun! The prizes were great and people were motivated to enter. I had awesome women that commented on the ad and shared it! Facebook loved that and increased my ad reach. For this ad I decided to run two different images and display it only to people that had visited my website in the last 6 months. I didn’t want to spend money on new or lookalike audiences because I am not that knowledgeable in them yet. The picture of me performed much better. So much better in fact that I pulled the tulip ad after four days. This picture of me ad is one that I used back in my old marketing blog and it worked better then too. The results for this ad weren’t as great as the ones for the giveaway. They were decent but not great. This tells me I have a lot more to learn on Facebook ads, but I knew that already! Takeaway: Don’t be afraid of Facebook ads! Set your budget to $5 a day and set it to people that have visited your blog in the last 6 months. Make sure you have your Facebook pixel set up even if you aren’t doing ads right now so you can capture that traffic when you are ready. I also look at Facebook ads like walking into a casino. When you walk into a casino with $20 you are doing it for fun. You have to be prepared to walk out with $0. The same goes for Facebook ads when you are learning how to do them. Be prepared to blow through $40 in one week and not see many results. It’s an experiment until you learn what works for your audience! 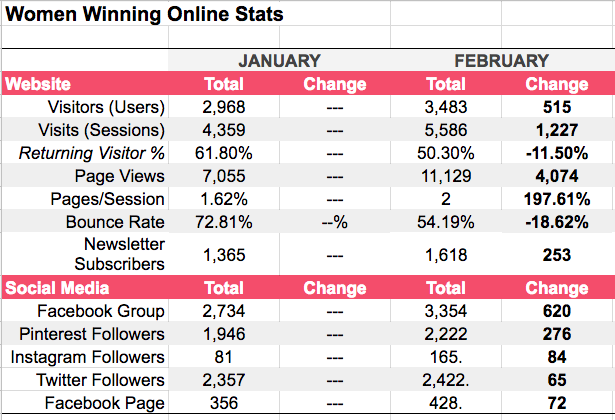 On February 13th I debuted a new look for the Women Winning Online Facebook group. I had been wanting to do this for awhile. I figured my year anniversary was as good as time as any! I also took away some of the less popular prompts and added a couple new ones! The ladies in the group really loved them and I appreciated their kind words! I don’t feel like any kind of graphic design is my strong suit. I can take a template and make it look good, but I am not good at creating things from scratch. The new design came from a mashup of different Canva templates. I wanted to make it feminine so it appealed to women, I wanted to highlight the tagline, and I wanted to include only my brand colors. I also wanted it to match my Pinterest pins. I think I did alright with this one! Takeaway: Don’t be afraid to change things up now and then! It will help your brand stand out on your blog and on your social media sites. My one tip is to make sure your designs match across all your platforms. This will help people recognize your brand and help you stand out! The majority of the days in February I was up early. And by early I mean by 5:00am. I have a love/hate relationship with getting up early! By nature I am a night owl. I love being up until the wee hours of the morning working on stuff. It is so quiet and the only deadline I have is the morning sun. But, I am no longer a spring chicken. I am no longer 31. (Booo!) I used to be able to work until 2am, get up at 7am and be ready to go no problem. Not so much anymore. When I do that now I am not pleasant. I am crabby and I snap a lot at my husband and kids. Not good. So I worked hard this month to flip my schedule. Go to bed earlier (which I hate!) and get up earlier, which I kinda like! I like getting up and watching the sun coming up. I love my quiet time with God before the world wakes up. Then I love to write and work on my blog in peace and quiet. I also have realized that my brain works better in the morning after a good night’s sleep. I am far more clear headed in the morning than at night. This is a switch for me because the opposite was true for many years. I get more done in the morning and am a much more pleasant wife and mom when everyone wakes up! Takeaway: Get up early! If this is something you struggle with like I did give yourself a few days to make the switch. I took a few days and went to bed a little earlier each night and got up a little bit earlier each day. It took me a few days to make the flip but once I did I loved it! I have been wanting a MacBook Air for years. Years! But I couldn’t justify the cost when A. I wasn’t making enough money and B. my laptop was working jsut fine. It was slow but it worked. But my PC was growing from bad to worse. It would take 30 minutes to boot. The internet would drop and I would have to reboot. It would take 5 minutes to switch between programs. It was slowly sucking my productivity and driving me INSANE! When you only get to work in two hour time blocks and your computer is sucking up 30-45 minutes of that time, it isn’t good. On President’s Day of all days I checked Best Buy to see if they had any sales on MacBooks. Lo and behold they did! In fact it was the same sale they offered on Black Friday. I wanted to buy it then, but chickened out because it really wasn’t in the budget. I have regretted it ever since. On that Monday, my husband enoucraged me to run to Best Buy and get my MacBook so I did. I was still nervous because it wasn’t 100% in the budget, but my PC was killing me. I went to Best Buy and 20 minutes later walked out with this beauty. After only a few days I was in love with my MacBook! I can’t tell you how fast it is compared to my PC! I know it’s new, but I also know that Macs have a reputation of holding up better than PC’s. I also love that when I boot it, it takes about 3 minutes. That has never happened with any PC I have owned. Another bonus is the battery. I can work from anywhere and I don’t need to plug it in! I plug it in at night to charge it and it lasts all day. My MacBook has dramatically increased my productivity! Takeaway: Don’t be afraid to invest in yourself and your blog, even if the funds aren’t quite there. Sometimes it really does take money to make money. If you are scared to invest in something, but are confident it will help you grow your blog, try to find a way to make it happen. In February I re-kickstarted the Find Your Tribe Online Facebook group that is available to women in my course. I want to make this group a valuable bonus of the course. I want it to be a group where we implement the strategies of the course together. I want it to be a safe place for people to get their questions answered and their needs met. This is exactly what has been happening and I am loving it! I love the big group that is Women Winning Online, but I also love working in these smaller mastermind groups too. People do feel more comfortable sharing in smaller groups. We are also all working on a common goal which makes it a closer group. I am looking forward to continuing to nurture that group! Want to join us in the Find Your Tribe Online Facebook Mastermind Group? Get the course here and come join us. We would love to have you! In the group we are doing challenges to grow our traffic, sharing tips that are working for us, and doing our own special promo days. It has been a lot of fun watching the women grow and stretch themselves! Takeaway: When you are creating your courses look for extra ways to engage your students. Give them bonus access to you and a small mastermind to enhance the course. Also take time to have the group help you too! It’s more fun when you can work with other people to meet common goals! Ah good ol’ life happened to me the last week of January and the first week of February. I got the flu, both kinds, back-to-back. Ain’t nobody got time for that! Especially us Mamas am I right?! Not only do we not have time to slow down and get better, but we also have to be in panic mode so the kids don’t get it. My son brought it into our house and we got him through it fairly quickly. Then I was at the grocery store with the kids after not feeling well all day. All of a sudden a flash run to the bathroom and it was over for me. My husband met me at home, took the kids, and I spent the next two days in bed trying not to throw up. The only cool part is I got hooked into a cool documentary about the 1980’s. But the thing is when you are self-employed the show must go on! And I was in the middle of a big show— the giveaway! So sick as a dog I updated the giveaway landing page, sent out the emails, and posted in mine and other Facebook groups. The show must go on! Oh and if I can whine for a minute? My birthday is February 7th. Every.single.year. without fail someone is sick on my birthday which means no fun plans for me. Whhhhiiiinnnnneeeee! Takeaway: Rest or your body will find a way to make you! There are no big takeaways here because getting sick is not fun! 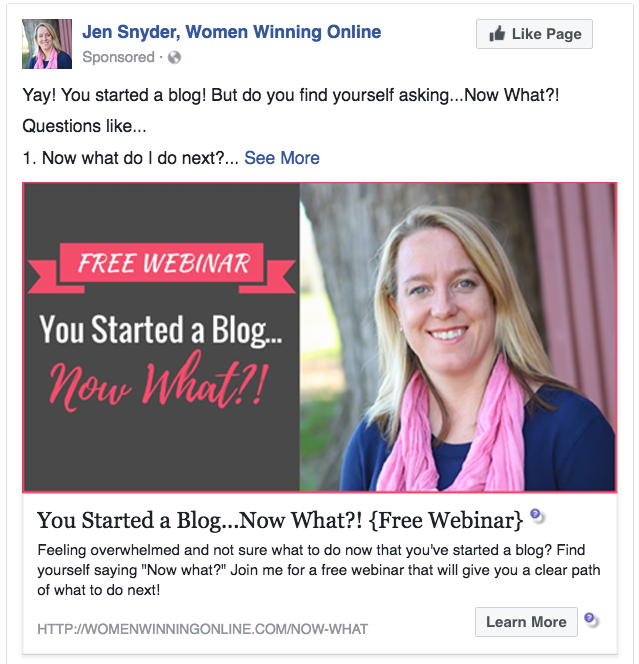 My webinar, “You started a blog, now what?” is in the wins for content and teaching people good information. But I did have another goal for the webinar: sell my Find Your Tribe Online course. In my previous blog when I did webinars I knew that 40% of the people that signed up would show up to the webinar live. From that 40% I knew 20% would buy my course. The numbers are not translating to this blog and I have spent time analyzing why. First my live attendance numbers are lower. They are closer to about 8%-10%. That’s pretty low considering all the time I put into the webinars. I did notice though, more people watch the recording so that’s good. But I get the turnout issues. We are busy moms and busy women! It is hard for us to attend these things! Heck it’s hard for this Mom to find 2.5 hours of time to give them! I am brainstorming and working on new solutions that work better for all of us. I want to give you the information in an easy way for you to consume it. I have some ideas up my sleeve and look forward to sharing those with you over the next few months. The other thing I am seeing is that more people are buying Find Your Tribe Online from my emails than from my live webinar. In my old blog it was common for me to see 5-10 people buy my course immediately after the webinar was over. Not so much with this blog. I think we as women don’t jump at things like this. We take time to process it, read the reviews, and process it some more. That’s fine by me because that’s how I do things too! I do need to sell this course and I want you to have it because I know it works. But I want to present it to you in a way that works for you. I am still figuring out how to do that! Takeaway: Don’t get discouraged when an idea you have doesn’t work even if it has worked for you before. Analyze what went wrong, think about your readers, and then brainstorm new ways to do things. Remember blogging is all an experiment! 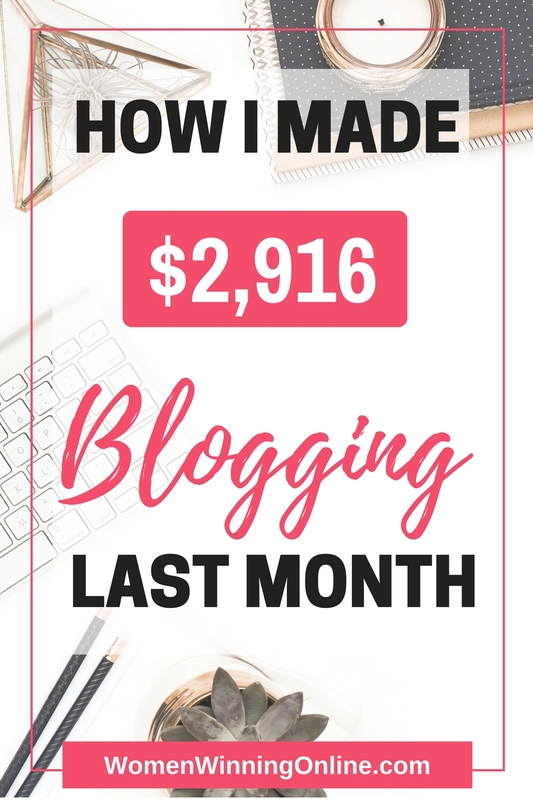 Am I making money blogging? Yes I am. Is it something I can count on? No it is not and that sends me into a panic every month! Up until the last week in February I thought it was a bust financially. I was stressed about it too. I feel this way the first week of March too. I hate this feeling! My desire is to make a decent, not crazy, income blogging and have it be consistent. I would love to have a system figured out where I know I am going to make $5,000 a month every month without fail. I feel like I am getting closer to figuring that out, but in the meantime I am stressing! Oh and when I figure it out, you better believe I am going to come back and report it to you! Takeaway: Blogging is work. These people, myself included, that are making money doing it didn’t just get lucky. You have to figure out your audience, what they need, and then figure out how to give it to them for both free and paid. In the middle of all that you have to figure out how to earn a living. It’s not an easy business! But it’s fun isn’t it?! Use BoardBooster for my Pinterest strategy←–Trying something new from this course! Brainstorm who I want to guest post for and what I want to write. Pitch at least 3 new bloggers for guest posting opportunities. I am excited about March! I feel like it is going to be a research and recovery month for me and I like that. It’s good to slow down on your blog every once in awhile to figure out the steps to take the next leap forward! How was your February and what are you looking forward to in March? I would love to hear about it! Please share with us in the comments below! What a very inspiring post, Jen. A great income-generating month indeed! So glad you found the post inspiring, Jocelyn! It was a great month and I’m appreciative. Thank you for commenting! Congrats on all that you’ve achieved! Love how thorough your reports are. 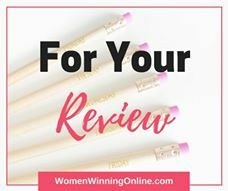 It’s so helpful for us (other bloggers) to see your wins and some things that need improvement rather than most people who just shout out all of the amazing things they’ve done without ever explaining that sometimes things don’ work. Wishing you much continued success and love the FB group btw! Thank you for your kind words, Nicole. I believe it’s important to be transparent in both what works and what doesn’t work in order to effectively help other bloggers. I am so glad to hear that you also love the FB group! There are so many inspiring women in it to learn from. Thank you for commenting! 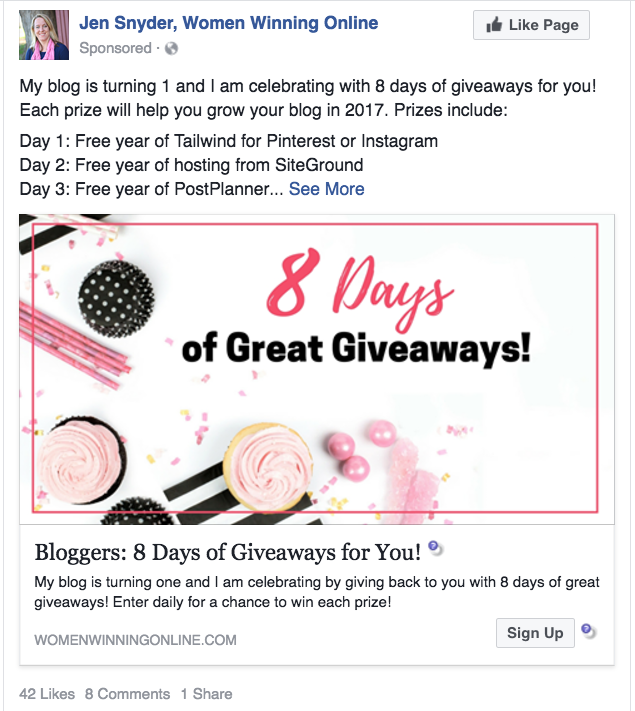 I love the information about Facebook ads as I’m currently running a giveaway… more info like this in the FYTO course would be GOLD! Also, I totally feel you about the rollercoaster of a ride building up a blog to provide consistent (stable) income can be! I’m on that rollercoaster right now haha. You’re inspiring and I love to follow your progress. Congrats on the February success and may March be even BETTER! Eden, I am glad you found the information about the Facebook ads helpful! Reaching a consistent income certainly is a rollercoaster ride, but hang in there. Thank you for your kind words and I wish you great success in March as well! Thank you for commenting! I love this post. It took me several hours to read it (I had to stop several times to feed my twins lunch, empty the dishwasher, load it up, clean up and having coffee!) but I read it! First off, I’m soo happy you are doing great! I’ve never used FB ads and not sure when I will. But I like your tips and it’s something to consider for sure! Congrats on your growth and I know you’ll smash all your goals! Elna, I can certainly relate to it taking hours to read through something (mom life)! Thank you for your kind words! It was a great month. FB ads are definitely something to consider. I hope everyone in your household feels better soon! Thank you for commenting! There’s no use beating yourself up over the misses we encounter. It’s all part of the process and there’s something to be learned from them as well. Looking forward to seeing you in the group soon and thank you for commenting, Tania! Thanks for sharing all of this, Jen! It’s incredibly inspiring and also got my gears turning. 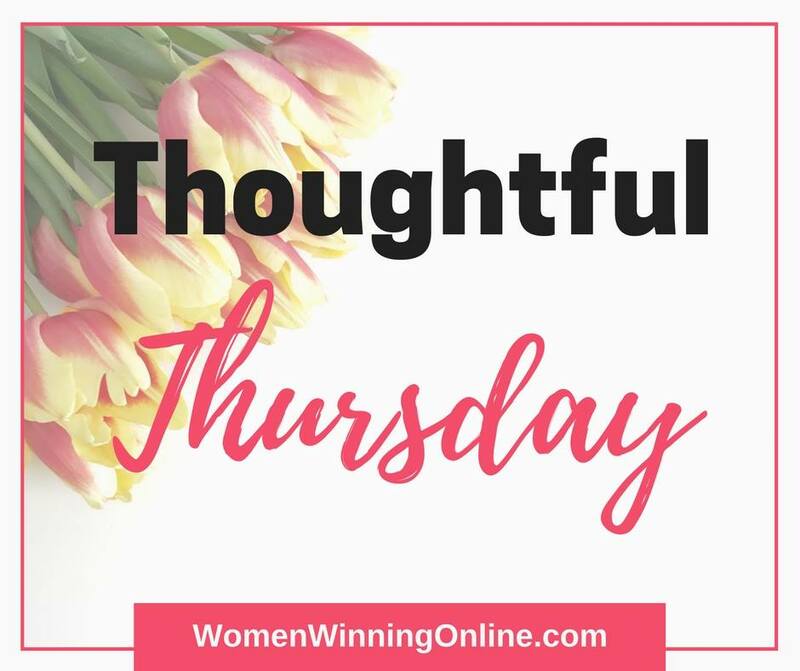 I’m thinking about what tips I can use for my blog. I am so glad to hear the blog post was inspiring to you, Erin! I look forward to seeing what tips you utilize for your blog. Thank you for commenting! I LOVE this report. Very thorough and full of great insights. Thanks for sharing with us! I totally agree that there’s not a lot of info about “what to do next”, one of the main reasons why I started my current blog. It’s good to see someone trying to make that info more available, too! Good luck with your new goals! Your words made me smile, Stephanie! I am so glad you found the post helpful and I completely agree about the “what to do next” question. As you work on your blog, feel free to contact me if you have any questions. Thank you for commenting!